Homepage > Blueprints Blog > Insulated Concrete Forms: The future of Concrete Walls? Insulated Concrete Forms: The future of Concrete Walls? Insulated Concrete Forms (ICF) are fairly new to the construction industry in our area. 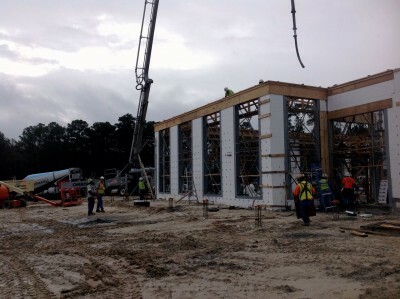 These styrofoam forms come in blocks and are being used in the construction of the new Georgia Welcome Center in Chatham County. They are uniquely designed and have both challenges and advantages. So how do they work? The two styroform sides are held together with plastic spacers/ties that also serve to locate the reinforcing inside the wall as well as provide an attachment point for follow-on trades. The blocks are stacked, “lego-style” to make the wall form, openings are blocked off with traditional wood bucks or with specialty metal frames called Integrated Frame Assemblies (IFA). The walls are braced full height, and poured with concrete, usually in one pour. After the concrete cures, the braces are removed, but the styrofoam remains, acting as moisture barrier, and as continuous insulation for the building envelope. This type of construction has definite benefits. Since the styrofoam stays in place after pouring, this construction method saves the time and debris of stripping forms, eliminates the need for separate moisture barriers and applied exterior insulation, and a 6″ wall creates a R-value of around 25, with no thermal bridging. This means that buildings built with ICF conform to the new Energy Code requirements for continuous insulation, and provide an energy efficient product for the owners. However, the challenges faced with this type of construction are unique. 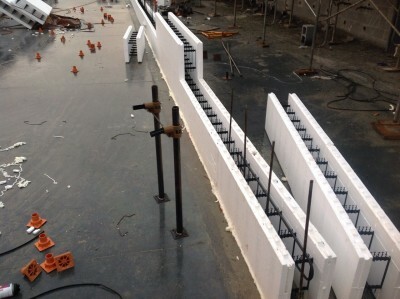 Firstly, there is not a large subcontractor base with the knowledge to construct the ICF walls, so finding a subcontractor with adequate experience can be difficult. The learning curve for laborers who have not worked with this material before is noticeable. Secondly, the reinforcing and embedded items have to be installed as the forms go up, and the inspector has to work hand-in-hand with the installers. There is no one-siding the wall, putting up rebar, inspecting, and then closing it up. Lastly, all the follow on trades have to understand the construction type and be able to integrate their products in the non-traditional walls. This means the electricians, plumbers, and even drywall trades need to include materials and methods that work with the ICF construction. The advantages are great, but right now the challenges are many. However, as construction develops, ICFs may provide the answers to many current insulation difficulties. John graduated from Southern Polytechnic State University, receiving a Bachelor of Science degree in Construction Management and a minor in Business Administration. John joined the R.W. Allen team in 2015, bringing with him more than eight years of experience in the commercial construction industry.